The Native American peoples, and their centuries of living among the many creatures on the earth, possess vast knowledge of the changing of the seasons. 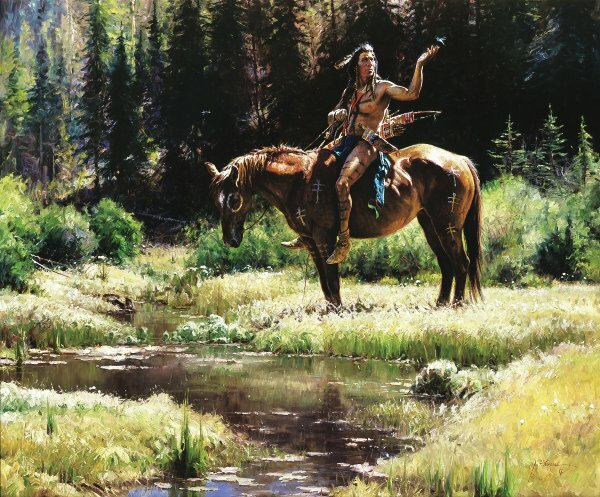 This brave is greeted by a dragonfly as he rests his horse by the stream. Perhaps he and his steed have been on a long journey. With the arrival of the delicate, gossamer-winged "Dragonflies," the Indians knew that mother nature would soon bring the renewal and vitality that spring provides.